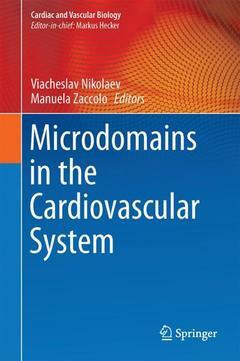 The book comprehensively presents new findings in cardiovascular research related to signaling microdomains in health and disease. Important second messengers such as cAMP, cGMP, calcium and their role in microdomain signaling are discussed. The book offers and explains methodical approaches and technical ways how to successfully analyze microdomain signaling, also in the context of disease. It further provides scientific perspectives and strategies that are based on the concept of signaling within microdomains and that can revolutionize pharmacology and eventually lead to the effective treatment of cardiovascular diseases in future. This book is written for scientists in cardiovascular research, pharmacology, molecular and cellular biology as well as medical doctors in cardiology, angiology and nephrology. Receptor-cyclic nucleotide microdomains in the heart.- Membrane Microdomains and cAMP Compartmentation in Cardiac Myocytes.-Function to Failure: Compartmentalization of Cardiomyocyte Signaling by A-Kinase Anchoring Proteins.- Pharmacological approaches for delineating functions of AKAP-base signalling complexes and finding therapeutic targets.- Chatting second messengers: PIP3 and cAMP.-Cyclic nucleotide phosphodiesterases and compartmentation in normal and diseased heart.-cAMP compartmentalisation and hypertrophy of the heart: ‘good’ pools of cAMP and ‘bad’ pools of cAMP coexist in the same cardiac myocyte.- Subcellular targeting of PDE4 in cardiac myocytes and generation of signaling compartments.- Cardiac cAMP microdomains and their modulation using disruptor peptides.- Computational modelling of cyclic nucleotide signaling mechanisms in cardiac myocytes.- SIGNALING MICRODOMAINS: THE BETA3 ADRENERGIC RECEPTOR/NOS SIGNALOSOME.- Compartmentation of natriuretic peptide signalling in cardiac myocytes – effects on cardiac contractility and hypertrophy.- Cyclic GMP/Protein Kinase Localized Signaling and Disease Implications.- Distribution and regulation of L-type Ca2+ channels in cardiomyocyte microdomains.- The Role of Local Ca2+ Release for Ca2+ Alternans and SR Ca2+ Leak .- The control of sub-plasma membrane calcium signalling by the plasma membrane calcium ATPase pump PMCA4.- Calcium microdomains in cardiac cells. Prof. Viacheslav Nikolaev, PhD is the Director of the Institute of Experimental Cardiovascular Research at the University Medical Center Hamburg-Eppendorf, Germany. He is also a member of the German Center for Cardiovascular Research (DZHK). His main interest is live-cell imaging of cardiac cAMP and cGMP microdomains and their role in heart failure. Prof. Manuela Zaccolo, MD is the Director of the Burdon Sanderson Cardiac Science Centre and works in the Department of Physiology, Anatomy and Genetics at the University of Oxford. She is interested in the regulatory principles by which intracellular signalling networks achieve the plasticity and context-sensitivity necessary for a cell to function. A central topic of her research is the role of local regulation of cyclic nucleotide signalling in healthy and diseased hearts.